The community consists of both Grand Isle and Cheniere Caminada and is located in Jefferson Parish at the southern tip of LA. Hwy 1. Located on the Gulf of Mexico, the primary businesses for island residents are tourism, the seafood industry, and oilfield related professions. Originally inhabited in the early 1700's, Grand Isle is a relatively small community with a population of approximately 1,500 people. However, during the summer when vacationers begin flocking to the island, it is occupied by more than 12,000 tourists taking part in activities such as the Grand Isle International Tarpon Rodeo and Fourth of July festivities. 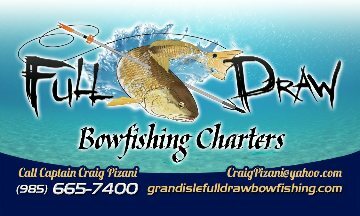 So, if you are looking for a fantastic vacation, come visit Grand Isle and see why Louisiana is referred to as "The Sportsman's Paradise"
GRAND ISLE State Park, Pier & Beach are now OPEN! The Old Fishing Bridge is OPEN! NO boat, NO problem! Fish the 'Old Fishing Bridge' it is open 24 hrs/7 days a week. Lights at top and bottom of bridge for your convenience. We ask that you please be considerate and throw your trash in the receptacles. Thank you.